What questions do you have about the draft? As you can see from WP 3, MLA is a mess. Don't forget you must site a primary source document in your paper! Other areas you need help with? 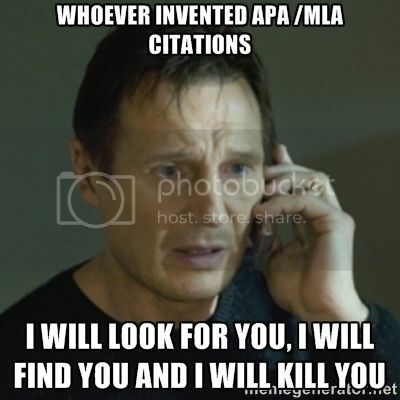 Correct your Works Cited list. Use the correct citation on the Works Cited list to tell you how to create a correct in-text citation. What if you are using a signal phrase? The signal phrase MUST MATCH the first entry in your citation, or else you'll still need to use an parenthetical citation. You'll still need to include a page number parenthetically even if you use the author's last name in a signal phrase if you are citing a print source. Make final revisions to WP 4. WP 4 is due at the beginning of class on Friday. LATE WORK ABSOLUTELY WILL NOT BE ACCEPTED PER THE TRIAD C LATE WORK POLICY. Please submit a printed, stapled version of your paper and include a print out of the rubric. Bring all materials you need to work on your power point presentation in class on Friday with your group.